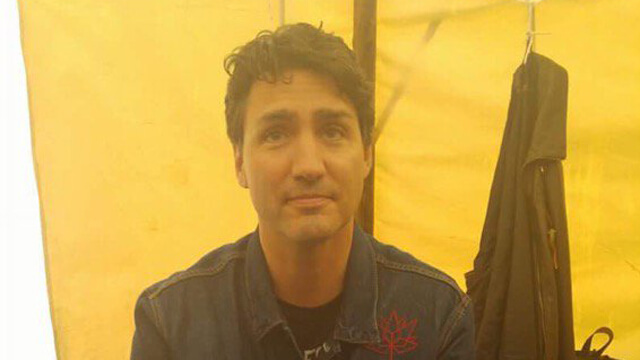 Trudeau inside a ceremonial teepee on Parliament Hill during Canada Day 2017. Photo courtesy of Russ Diabo. But these positive developments have been undermined and overshadowed by Trudeau’s approval of Kinder Morgan’s Trans Mountain pipeline expansion project, the Keystone XL pipeline, Pacific NorthWest LNG project, and the Site C dam. All four projects shatter any type of nation-to-nation relationship Trudeau had in mind. The Site C dam in British Columbia’s Peace River Valley will flood First Nations territory. Elsewhere, other First Nations worry about oil spills that could cause food and water contamination. Trudeau’s unwavering approval of these projects also contradicts the United Nations Declaration on the Rights of Indigenous Peoples, adopted by the Canadian government last year and requiring that the government obtain the free and informed consent of Indigenous people prior to any project affecting their lands. Meanwhile, the Trudeau government continues to racially discriminate against Indigenous youth by underfunding their child welfare services. Last January, the Canadian Human Rights Tribunal ordered the Trudeau government to take immediate action, but four non-compliance orders later, they continue to break the law. Trudeau can no longer scrape by with prime ministerial tweets and tokenistic gestures in the hopes that they might somehow solve the problems at hand. Indigenous people, and upcoming generations, want more than “a place to store their canoes and paddles so they can connect back out on the land,” as Trudeau said back in January. At least Stephen Harper was up front about his assimilationist agenda. Trudeau promised us hope and then turned his back on us.